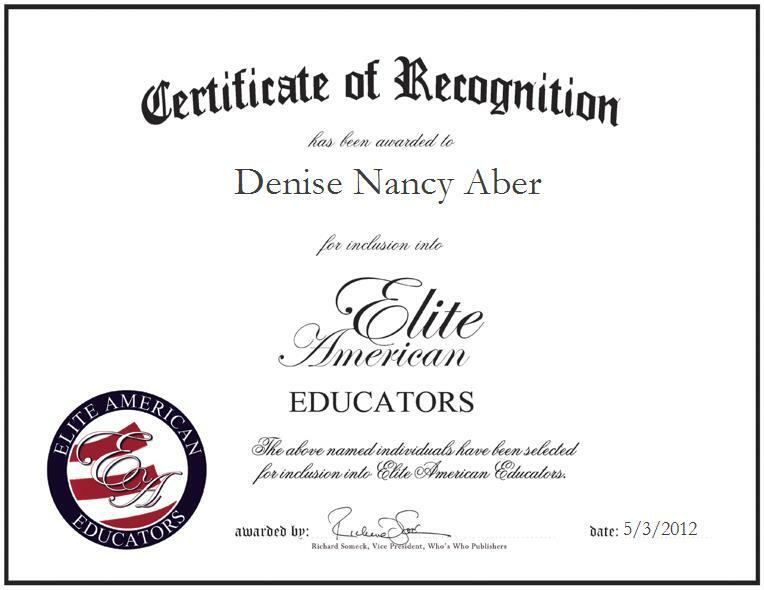 Denise Nancy Aber is a Seventh-Grade Language Arts Teacher for Broward County Public Schools. She utilizes her vast knowledge in the instruction of strategies for studying and learning for children when teaching five classes for more than 29 students, and creating a unit guide for teachers. She pinpoints a major career highlight as her receiving the prestigious Broward Education Foundation grant; another being when one of her students won the Broward County Family Literacy award, because she was one of 13 out of more than 5000 students. Ms. Aber is also responsible for overseeing areas concerning the Internet, fact hunting, and comparing and contrasting, and for listening to audio to improve note-taking processes, and instructing vocabulary, taught within the context of a book. Renowned as an educator and instructional strategy expert, Ms. Aber has also published poems in the UK. Ms. Aber is a committed life learner who always finds engaging ways to improve herself as an educator and to keep her students’ needs met. She enjoys interacting with her students and recognizing students with opportunities such as Florida Young Scholars and the USAA’s student recognition program. In addition, Ms. Aber feels that by continuing her education and attending professional development opportunities whenever possible, she has been able to set an example to others. Even if no service points or money is involved, she will take her time out of her busy schedule.